I looked at the boy, who was silently watching his fly, and it was my hands that held his rod, my eyes watching. I felt dizzy and didn't know which rod I was at the end of. What is passed between parent and child, and how does this happen? Generations is the title of the current exhibit at Hopkinton Center for the Arts, and the title refers to the relationship of the two exhibiting artists, my daughter, Ariel Matisse, and myself. 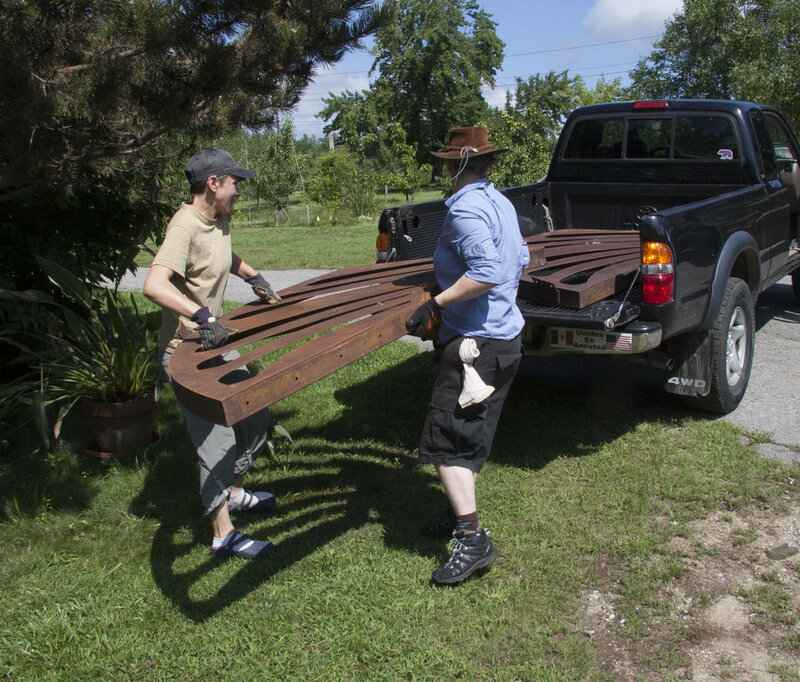 Less than two years ago, Ariel decided to make an outdoor sculpture for our annual sculpture exhibit at the farm. This was the summer after she helped with the exhibit, After Apple Pruning . Taken with using wire while working on a collaborative sculpture for that exhibit, Ariel wanted to make a wire tree and asked to use a hollow log I had in the studio. I’m always fascinated with hollow logs—the form and the emptiness. The heart sutra, chanted daily in all Buddhists monasteries, says, Form is emptiness, emptiness is form. Ariel wanted to gold leaf the saw cut, the way I have done since making the six-part Inside the Ordinary Maple in 1998. ﻿ “Of course, I will show you.” First you sand it smooth, gradually using finer sand paper. Then it needs to be urethaned to seal the wood. Moisture seeping up into the gold leaf will lift it. Then you need to apply the sizing and wait for it to be the perfect tackiness to receive the leaf. Gold leaf is between .1 and .125 millionths of a meter or micrometers. One thousand sheets will equal an ordinary piece of paper. It’s not something you can grasp with your fingers. To pick up a small fragment, you will find a soft watercolor brush is useful, rubbing it first in your hair to create some static electricity. For large areas, I use a rolled leaf that comes with a thin backing material. Once the leaf is placed down on the sizing and pressed in gently, you lift off the backing. Ariel and I sat around the log each on our stool, our hands moving together. I watched her fingers. They knew how to hold the tools, to feel the smooth surface of wood, to lift the backing. I showed her how to shine the gold, to burnish it with a cotton ball. Then the project was all hers. Cutting wire to length, hanging this Medusa head of tangled wires from a hook on the ceiling, bending, shaping, counting the complex pattern. Twisting the roots and drilling the ends into the trunk. Where did she learn all of this? When? What is transferred between mother and daughter? Or, father and daughter ? Ariel’s father is a gifted ‘maker of things’, as he likes to say. When the director of the Center, Kris Waldman, needed a show to fill the slot from January 25 to March 15, my name was suggested. She came to the studio on December 24th and took photos. As she was leaving, I said I’d like to do the exhibit with my daughter. She was surprised at first, but then I pointed out two of Ariel’s pieces, Spiral, on the wall, and Willow, her first tree, the one we had gold leafed together. Ariel then sent Kris photos of her newer work. Kris chose sculptures from each of us and suggested the title for the exhibit. 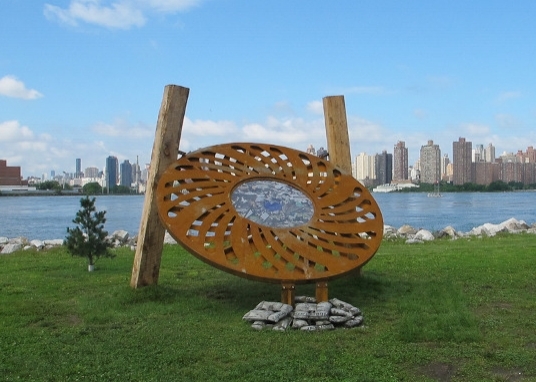 One of my pieces is, Filling the Vessel, a large five-panel sculpture I made in memory of mother. In the gallery, it faces the wall of Ariel’s sculptures. I feel I am in between the two of them. I relate to E.B. White’s uncertain feeling of no longer knowing who he is. I seemed to be living a dual existence. I would be in the middle of some simple act, I would be picking up a bait box or laying down a table fork, or I would be saying something, and suddenly it would be not I but my father who was saying the words or making the gesture. Recently, my art no longer feels like something I own; it belongs to something more fluid, a stream, a flooding of creativity across generations. I’m playing my part, doing what is in front of me, inhabiting my life as fully as I can, yet letting it flow. E.B. White describes how, while in the boat with his son, “A school of minnows swam by, each minnow with its small, individual shadow, doubling the attendance, so clear and sharp in the sunlight.” He seems to be seeing himself as one of these minnows, insignificant, one of the schooling fish. It’s points to the conundrum of form and emptiness. The shadow and the real are inseparable. White is not father and not son; and both father and son—a beautiful rising and falling of creation. The living and the dying, and the what never dies. We hope you will see the exhibit at the Hopkinton Center for the Arts, Hopkinton, MA, and perhaps join us at our reception on Friday, March 1; 6–7:30 p.m. The gallery is open Monday–Saturday, 9–5 p.m. and during the center’s evening events. The exhibit is up through March 15. 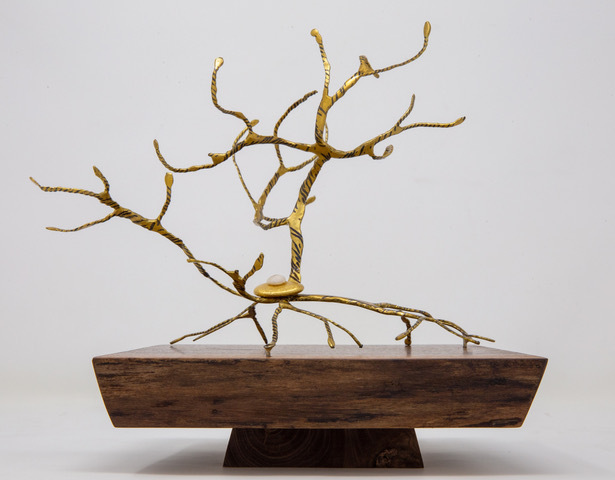 Left: Ariel Matisse, In the Garden, 2019, copper wire, walnut, 11" x 6" x 5½". Right: Linda Hoffman, Long-Legged Man, 2006, bronze, branch, wood block, 65" x 16" x 16". My mother, Annette Weiner, would be so happy to see the exhibit. If I had thought of it earlier, I would have suggested we exhibit one of her paintings along with our sculpture. When my mother went to college, she already had two children ages six and nine. Starting out as a Fine Arts major at the University of Pennsylvania, she then changed to anthropology and went on to earn a PhD the year I graduated from high school. As in the orchard, the cycle continues from seed, to blossom, to fruit. This poem by Dawna Markova says it well. The last blog I wrote was before I left for a Buddhist pilgrimage to India in early October. When people ask how was the journey, I usually begin to talk about painting. 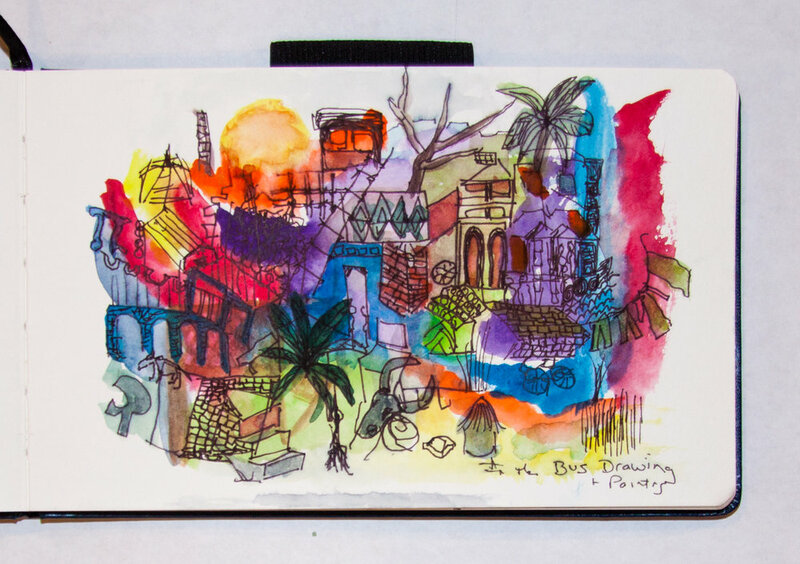 Uncharacteristically, I journaled throughout the trip not with words, but with small watercolor paintings of important sites and experiences. Now, as this year ends, I am turning towards words as a way to understand how I was changed by the trip and to share it with you. It’s been a curious enfolding. When I was a young child, a large Arborvitae grew outside our small row house in Chester, Pennsylvania, an industrial city with streets of row houses and screen doors that banged. We were among the few Jewish families, and we drove to Center City Philadelphia to celebrate holy days in the city’s oldest synagogue, Rodeph Shalom. The recitation of the Kaddish was my favorite part of the service because the grownups rose while the children remained seated, and the endless rhythmic chanting of V-im-ru ah-mein in the mourner’s prayer made me feel I belonged to a great sadness. However, when I was fourteen, I became disillusioned with Judaism and became interested in Eastern religions, eventually taking Buddhist vows. The pilgrimage to India was a journey to the roots of Buddhist spirituality. Our group of sixteen Zen practitioners meditated under the Bodhi Tree where the Buddha attained enlightenment, and listened to the Abbot of our monastery give a talk on Vulture Peak where the Buddha gave many sermons to his followers 2500 years ago. We visited the sites of the Buddha’s birth and of his death, a cave where he meditated, and stupas built to honor his most faithful disciples and his mother. I painted it all. On the last day of our trip, I saw the headlines, “Eleven Jews killed in the Tree of Life Congregation Synagogue.” I remember thinking something like, ‘it never ends’, but my reaction was shallow. When I returned home from India all I wanted to do was to paint. The Catalpa Tree was waiting for me outside my studio—this giant of a tree that I had been drawing and painting over the last six months. 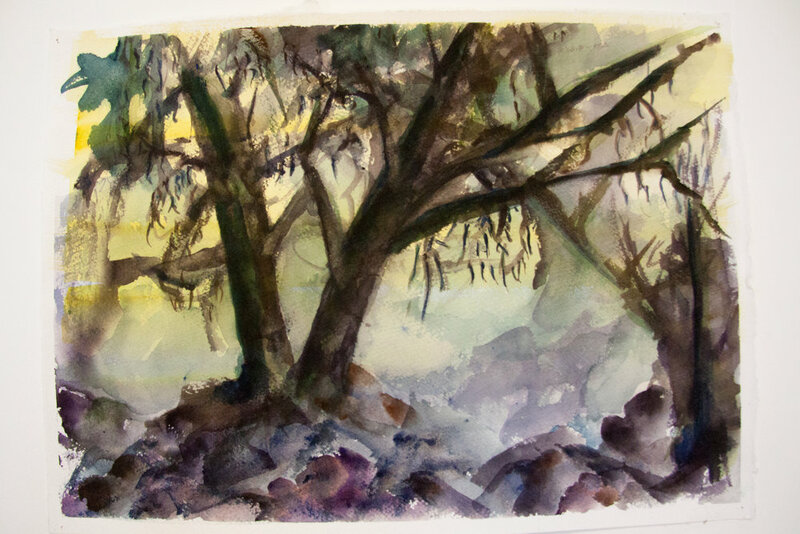 Dissatisfied with my prior efforts to capture its strength, I decided to paint the energy of its massive trunks, not the outer form of the tree. I painted one painting, tacked it to the wall, and started another, sometimes going back to work on an earlier one after it had dried. Around painting number five, this great sadness welled up inside me. What was I doing? Where was it coming from? Some of the paintings had fire and flame; not just trunk and furrowed bark. I listened closely, and from my heart rose up the words, “On October 27, 2018 eleven Jews were killed at the Tree of Life Temple in Pittsburgh.” I knew I had to paint eleven paintings to honor each person who died. Their names were familiar—Rabinowitz, Rosenthal, Stein. I come from a long line of Steins on my mother’s side. A few weeks of seeing the paintings on my studio wall, I decided to do something to make the deaths more visible. I cut each painting across at the height to mark each person’s age at the time of the shooting. I added a new section and then restored the painting to wholeness by reattaching the cut-off section. The Arborvitae of my childhood, the Tree of Life Synagogue in Pittsburgh, the Bodhi Tree in India, and the Catalpa outside my studio at Old Frog Pond Farm in Harvard all blended, each tree unique and yet all sharing the same roots. My journey to India connected me not only to Buddhism’s beginnings, but to my natal tribe. May all beings have abundant peace in the New Year. May we always see the perfection in the other. May we care for the earth with great love. May we not forget those who came before us and gave us life. Note: This series of paintings will be on exhibit in the Camilla Blackman Concert Hall at Indian Hill Music in Littleton, MA beginning March 1 with a closing reception on April 26th. And if you would like to hear a transcendent instrumental piece I recommend listening to Maurice Ravel’s (1875-1937) Kaddish. for violin and piano. Sheets of rain slice across the pond, while our thirty-eight resident Canada geese poke at their feathers or calmly stare. Human wellbeing often depends on being dry, out of the rain, but in those moments when I enjoy the geese, I also enjoy getting wet. You might call such a moment being alive, but as an artist I call it being creative. For by creativity I mean the potential to connect with the world outside oneself, whether near to home—the geese in the rain, a field of wildflowers, or far from home—the terror of immigrant children separated from their parents. When I experience long periods without this creative energy rising, I don’t feel connected. I fall into an abyss of my own mind, a morass of thinking about myself. Creativity makes me feel connected to the world. We all share this experience; it is inherently human. The opposite is also true. We can be in the most beautiful place and not appreciate it; we block the beauty from entering our marrow. We can be in the most loving relationship and not allow the love to enter. When we don’t connect, we don't belong. Caught in the rain, we fear our clothing is getting wet or ruined, and we make it a problem. We hurry, frown, hunch up, forget the larger picture. This longing to be connected with a big 220 amp plug drives my art. Even when I am grieving or burdened, when the world appears deeply troubled and dysfunctional, I try to keep this connective amperage flowing. For I know life will continue to change like wood to ash or leaves to compost, and human creativity is recognizing and living with these transitions and using them. A friend sent me a link to an article about an artist's painting exhibit. The artist, Kelly Thorndike, is an Iraqi vet who was stationed at the horrific Abu Ghraib prison when a bomb went off. In the second before shrapnel hit and seriously wounded him, Thorndike saw a nearby inmate blown to pieces. It’s worth a read. Creative work can help us process events and feelings we store in our minds. A few nights ago, I was finishing a new sculpture, a mandala of sorts, with a great hollow tree in the center, and small meditating figures surrounding it. Sculpture in process leaning on the wall. I think the outer work is complete, but I have one part yet to finish. 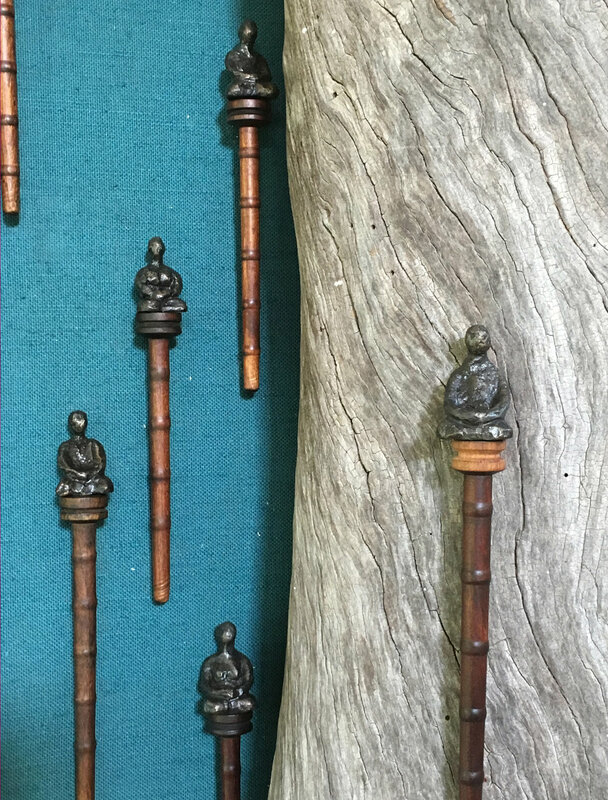 The Buddhas are sitting on wooden dowels, bobbins from an old textile mill in Lowell. They are hollow. I want to place a word, a prayer, a meditation for the world inside each of these wooden tubes. I cut up a watercolor and wrote single words on each one—compassion, wisdom, suffering . . . but then didn’t feel this was exactly right. As I was putting tools away, I noticed a bag of leftover National Geographic maps from making the sculpture, The Teapot Explorer. I pulled out one, ‘Peoples of the Mideast’, a map of Libya, Saudi Arabia, Egypt, Iran, Turkey, and Afghanistan, with pictures of all the different ethnic groups from these areas—Bedouin, Qashqai, Armenian, Turk, Lur, Kurd among others. In one corner of the map there is a box describing the ethno-linguistic groups titled, An Awesome Human Mosaic. I thought of adding the names of indigenous people inside each bobbin in recognition of the depth of so much human diversity. Then I opened a second map, ‘Great Migrations’, depicting eighteen migration patterns around the globe—birds, mammals, insects, reptiles, amphibians, crustaceans, micro-organisms, and fish. I traced the Monarch’s multi-generational migration of 4000 miles. I followed the equally miraculous journey of the Loggerhead turtle 9000 miles from beginning to end, back to the very beach where it was born. Each of these creatures as unique as the indigenous people I admire. I left the studio filled with awe. Early the next morning on my way to the studio, I stopped to visit the geese. Some of the them were on the dam wetting their feet, others stood in the lawn alongside it. I appreciated so much life right outside the door. Then I continued to my studio determined to write this blog. I’m not sure the blog is quite finished, and I don’t know how or when I will finish the sculpture, but as I look up from my page, startled at the sound of flapping wings, I see the geese practicing. It's flying-lesson time for the young.